Buying groceries on sale is a great way to save money in the budget but being selective about what you buy is also important. Not everyone has the same lifestyle so they will purchase different types of food for their diet. What we typically do is go through the grocery flyers to see what products are on sale and base our meal plan around those items. Those items are typically basic essential items and we also like to make sure our pantry is stocked to build a complete meal. If we can make our own homemade pasta sauce, soup and salads we will opt to do that over buying it pre-made. These are simple recipes that don’t take much time and are from what I calculated cheaper to make even when pre-made is on sale. I remember years ago we used to stock up on items with coupons such as those Stouffer’s pizza pocket thingys because they were cheap but looking back, what a waste of money. It didn’t matter that we only spent $0.50 on them I could have made them for less and they would have tasted better. In a way we got sucked into the coupon frenzy that was quickly squashed when we realized that we were relying more on frozen convenience and boxed foods instead of cooking homemade meals like we were used to. It’s easy to do that when the food is cheap but not necessarily our only options. We chose to spend our money that way it wasn’t that we couldn’t spend the $0.50 on a bunch of spinach or garlic etc. Don’t get me wrong we still bought fruits and vegetables etc. but we also had foods in the house that we simply didn’t need. These days we don’t use coupons as much but we still do on occasion especially with all of the deals on fresh produce which is toppling what was available years ago. We could still find fresh foods on sale using coupons back then but today it’s getting lucrative with coupon apps that are available. One thing we haven’t needed for years is health and beauty, laundry and cleaning items as we have enough of that to last us until we retire I think lol. It was always a matter of choice where we spent our grocery budget in terms of what was on sale and what we really needed. Just because something is on sale doesn’t necessarily mean it’s good for you either. Cheap groceries may not equate to a great bargain like I mentioned above. We try to moderate how much we eat of them or plan ahead to make it homemade such as olive pita for pita pizzas instead of frozen pastry pizza pockets. We’re not perfect heck we do buy processed foods but limit what we purchase. Processed foods taste good and they are meant to but we don’t always need to eat them in our diet. Purchasing tortilla chips are something we don’t normally buy as I try to make them myself as I enjoy making homemade tortillas. My wife made homemade dip and brought bagged tortillas to a backyard BBQ that we went to because that was requested of us. If we wanted to buy chips once in a while that’s OK too, all in moderation just not every week. We aim for more fresh fruits, fresh vegetables, dairy, grains etc. as opposed to pre-packaged foods. I believe as long as the thought is there to eat balanced, simple and delicious that cooking won’t seem like such a terrible task. I think most people will agree that simple homemade meals work better with their schedules. These days some people opt for organic food and say the heck whether it’s on sale or not I want organic fruits and vegetables and they are strict about it. 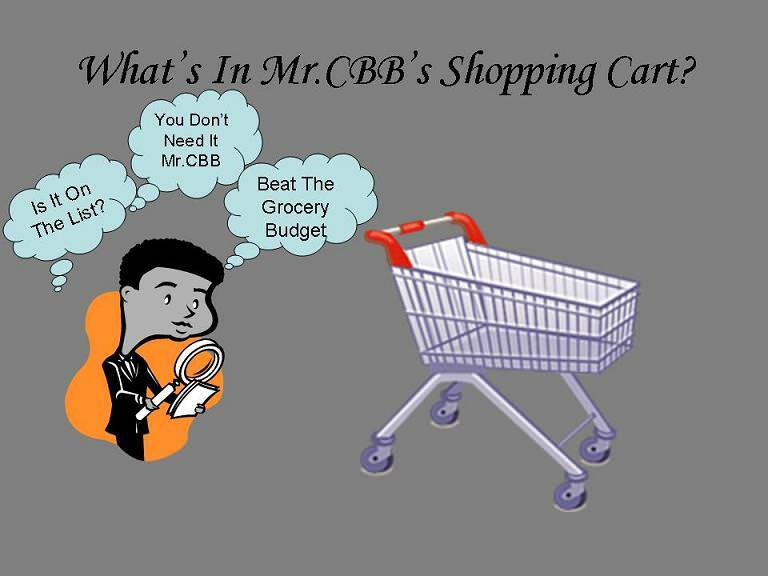 If you have a budget that you can stretch or that has lots of room it’s easier to make those decisions or you buy less one week to get the better products. I believe one of my fans said that is what she does. If it costs more to buy organic tomatoes (example) and she needs them she will cut back somewhere else in her grocery budget. Not all frozen food is unhealthy but it’s a great way to buy food that you don’t want to use up all at once such as frozen vegetables, frozen fruit and pre-made pastry shells etc. I wish I could stay home and make homemade food all the time but that’s just not reality so we really try to balance what we eat and make homemade what we can. This week for example we bought frozen perogies and tortellini. Although we’d love to make Nicola’s homemade perogies this week I didn’t have the time. I opted to add perogies that were a frozen product to our grocery list but I also bulk it out with lots of fresh vegetables. Essentially perogies and tortellini are noodles with filling inside. Items such as yogurt or BBQ sauce are items that you can make yourself, if you have time. You can whip up fresh homemade yogurt and make homemade BBQ sauce if you plan some time in your day. No, we are not on any strict diets (my wife was for a short time as requested by her doctor) but we know that sticking to what is on sale in accordance to our budget as long as we are keeping a good stock of healthy food in the house is important to us. I’ve been blogging about groceries since 2012 and have learned lots about the shopping habits from people simply by watching what they buy but also listening to what the fans have to say. I know that I have read blog posts from other bloggers who will not spare their grocery budget to wait for something to go on sale. In a way we are like that as well sometimes because you just have to bite the bullet and buy it. We won’t go without certain produce every week for example so if it’s not on sale then we are out of luck and we build our grocery budget around what’s not on sale as well. That means we might have to cut back in other areas. If you are creative with your fresh ingredients you can stretch a meal so it lasts for more than one meal meaning you don’t have to buy cheap food to make food go further in the house. One fan mentioned she turned meatloaf into a pasta sauce with meat. Brilliant idea. It takes time and practice but a healthy meal can be made with items on sale that do provide nutrients that we require in our diets. I know someone whose child will only eat processed foods because that’s what he grew up on. It wasn’t a matter of not being able to buy fruits and vegetables but it was because they chose to buy processed foods that were quick to make rather than taking the time to make a proper meal every night. Sure a take-out night is fine or a night where you might not want to cook so you make something easy like perogies or hotdogs and Kraft dinner but eating like that every night doesn’t expand your food creativity. Some kids are picky about food but eating processed food every day is also not healthy. I guess that’s why we see so many schools opting to change the menu in the cafeteria for the children. You get used to a certain food type and when you try to introduce any types of vegetables or fruits you may get shot down from the child because it’s not what they are accustomed to. Although grocery store prices vary stocking up on the freshest ingredients first and meal planning around them will ensure you are eating a healthy meal. One suggestion a friend of my wife’s has it to prep food on the weekends so it makes it easier during the week to cook. I thought that was a brilliant idea that way you don’t have to spend money on frozen pizzas. When I participated in the Welfare Food Challenge a couple of years back now I won’t lie and say it was easy, because it wasn’t. I had a set amount of money $26 which was incredibly low to shop with for one week’s food but I made it in the end. I was able to make delicious meals that were new to me in some ways but it helped me to stay away from processed foods. The biggest lesson I took from the challenge was that with planning and using items on sale that were good for me I could eat healthy for less. I was able to bulk out products by buying bulk food in larger packages rather than smaller simply by doing the math. That’s one thing many people forget to do when they shop for groceries on sale. If you don’t do the math that might mean you may not necessarily be getting the best price available. Don’t just jump on items because they are on sale think about what you are buying. Do you only buy food that is on sale? Weekly Overview: We had a not so bad week considering I’ve been out of town and we are trying to keep the food stocked for the summer especially since we like to make lots of salads. The garden has lots of fresh spring onions, garlic, chives ready to eat so we’ve been using them up. Not too much left to spend for the month so I imagine it will all go to essentials such as fruits, vegetables and dairy. We should be ok for bread but if need be I can make homemade pita or buns. I might just have to after seeing Juanita’s homemade bread in the What’s for Dinner post last night on Facebook. Delicious! Do your parents stick their nose into your bank account balance? I can’t remember what insert it came from but it is an awesome coupon!!!! I am lucky to have a great Target close by and really haven’t had any problems using their coupons and a manufacture at the same time. They will also let me price match and then use coupons on top of that which I have heard not all will do, so I am counting my lucky stars. Our weekly budget is $125 a week making this month $500. You get ballot #28. Great price on the Barilla pasta with the coupon. Was that a smart source coupon? awesome deal on the diapers as well. I have to watch for those Target coupons and the mfg coupons to use them together. I have purchased things not on sale before because of my forgetfullness…..but lately definetly not! if i know i can get a better price somewhere else on sale i will make sure to check it out. the only times i pay full price for things now are with my produce. If the sale items at one store look terrible i am willing to pay more somewhere else for better looking produce. Same with my meat. But things like diapers, canned food and such i know there is always somewhere that has them on sale so will always do my research. here is my shop for the week. Yes i used up my carry over actually for a christmas present. As the tickets went on sale and were selling out so quickly! I will be lowering my budget in july by fifty dollars and removing the pet expenses from my groceries and just making a seperate pet category. I end up with a combination of items on sale and items not but with price matching the item is almost always on sale somewhere and I take advantage of that. Another week doing alright. We didn’t spend very much, didn’t need very much. The Upper Canada Village trip with my son I found cereal on clearance made on site to try that fits into my hubby’s new eating plan. I didn’t buy a lot since we’ve never had it. If it is good I’ll be happy I got two different kinds, if not, it was only two bought not all of them there. We are still working on food in the fridge and we have arugula out of the garden, so we aren’t buying as much lettuce each week, the arugula is being mixed with whatever we have. Nice to have fresh again and I’m crossing my fingers that the slugs don’t take the arugula over. We did do a U.S. grocery shop again this week. We needed gas, and I can’t afford to fill up in Canada right now. Gas actually went down there in the last two weeks since we were there, a whole 17 cents a gallon. That’s huge, so a fill up cost us under $50 this time. While there we picked up a few of the basics and our favourites. We haven’t bought cheese in a while, and were fortunate enough to find a wheel of gouda for a great price (my mom bought brie for 2.99 there as well and that’s at least 5.99 for same size in Canada). Based on my hubby’s new carb conscience diet, the price chopper whole wheat bread is the best for him, my homemade is a bit tough to track right now. Fortunately it’s a great price. The rest is stuff we generally buy across the border. I know we were over our dairy limit this past time, but it all depends on who is at the border. Overall, the concern was for value, not quantity of any specific item. Since our U.S. budget is still not depleted yet, we will continue our trips across. Especially since our Canadian budget is so low. I know we’ve got enough set aside for about 4 more trips U.S. and then we will have to see where we can take it from there. My goal is to come in under budget on the Canadian side this month since May was so ridiculous. That way we can come out more even in the long run. Counting the weeks until my garden starts to produce more than arugula and spices. However, I can’t wait for our local fruit seasons to make their rounds this year. Our biggest targets for the U.S. are bacon, croutons, milk, butter, eggs (when not on sale at Shoppers), yogurt, cheese, whole wheat bread (it’s cut thinner, but not quite as thin as weight watchers bread), cold meat, hot dogs, heinz ketchup when it’s on sale there and pepperoni . We have to be careful with the fresh food since a lot of it can’t cross back and forth across the border. Most times fruit and produce are expensive anyhow, so I’m not missing anything. Some meats can be brought over, but has to be declared. We used to buy whole turkeys there until prices here came down. Our biggest treat are Keebler cookies since we can’t get it here. Gas is our priority since it lasts longer and is much cheaper. It seems like most of it are staples that would be in any kitchen. Is there somewhere online that will show you what you can and can’t bring over prior to going? Here are my shops for the week. I know I could make the sauce from scratch but the price this week was too good!! Plus the older boy can be a bit funny about textures so I try to watch that.I suspect it might be from his Asperger’s as I have read that those with that can have issues with food textures. Other than a quick trip into Canadian tire for Royale TP it was all Foodland. So I was over just a bit for the week but still under for the month. Looks like the strawberries will be good to go next week so I will be a very busy girl making my jam. The boys will be helping to pick so that will be nice. Hubby will stay home. I was talking to a girl that worked at the place I pick and she did say it looks like a really good crop!! The pasta sauce was a really good price as you can see as was the pasta!! I found some nice deals with stickered meat. The liver made for a very frugal dinner!!! The sausages, ground pork and ground turkey will make for some nice frugal dinners too!!! The Dove products were as well, normally I’d be looking at 5.99-6.99 for the body wash and the bar soap is the shea butter kind, usually more expensive than the regular. I can’t wait to try it!! I wish I still had a coupon for Stuart’s cat food but no luck and he was almost out. Heaven forbid Fatty runs out of food!!! All in all I still have a good amount left for the next two weeks, we will see how the strawberries affect that….Mind you they will be worth it!! I’m going back for more berries, likely on the weekend as I just found out I have some bridal wear to work on for a Saturday wedding. A friend of my daughter owns a bridal shop and it seems the bride left things to the last minute!! My gain! I checked my supply of jam and I should make another 15-20 jars of jam if I want it to last until next year. The coupon I was wishing I had was for Whiskas cat food for Stuart. He does like his Whiskas!! I try very hard to get good meals on the table and keep my grocery budget in line. It is worth it to see how I am doing and that I’m staying on track while making meals that most of us will enjoy or at least eat here.. The strawberries for jam might make the numbers go up for the month but the taste of the jam makes it worth all the work and bother. Does that mean you will be sewing for the wedding party? Hmm, I don’t think I have Whiskas but I can look. I don’t normally get pet coupons these days. I’m sure you will make up for it the next month. The past 40 days we have spent $117.14 on groceries. 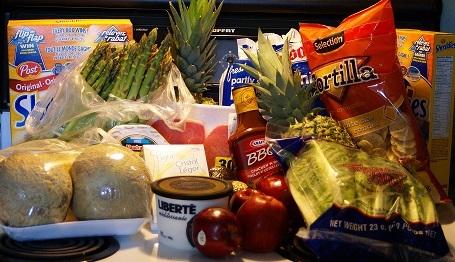 We bought a lot more food than that, but we used PC points. If needed, my husband and I go probably go a month, eating what we have on hand ..and just use $100 to supplement and fill in gaps. We live about 8 months of the year, outside the country, and when we returned, we noticed all groceries seemed to be a higher.Sales and reduced food, didn’t seem to be much lower. We’ve been bad though. 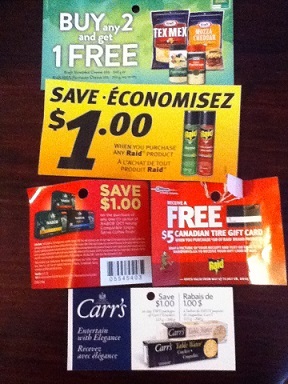 Tim Horton’s had these great coupons, and we used a lot of them..who can pass up free doughnuts! Anyways, I’m glad they expired over the weekend..back on track with healthier eating. After the first week of being home, we started using the bread maker…even at the bread thrift store,it is about $2 a loaf ! Same here.. once in a blue moon we buy corn or peas because it’s just over the top expensive in the winter. I try to get what I can on sale. I do have a small stockpile that tends to not last long. When I go to get groceries the first step is to see what basics I need by looking over the pantry, fridge and the freezers and list it, then I look over the flyers to see if what I need is on sale. Lastly I check my coupons to see if there are any I can use to up my savings.The coupons are tucked into my list and off we go. I’ll have a rough idea of what meals I will be making but that is always subject to change, depending on what is on sale and any half price stickers I find!! I’m trying to drift away from a lot of the processed foods as much as I can. I have some frozen fruits and veggies in the freezers to use for what ever meal happens to need a little help or to help stretch the leftovers. I do use a canned pasta sauce as a base to make spaghetti sauce and such. I don’t have much room to grow my own tomatoes or other veggies here as we have a small lot. Any leftover sauce gets put into the freezer for a future meal. My plastic containers are well used, nice part there is they are fairly standard in the measurements so I know how much is in each one at a glance. My kids were never picky with foods as they were given two choices every meal….take it or leave it. Hubby is usually the fussy one here, drives me batty some days. I can stretch the leftovers quite a bit as you have seen in the WFD feed at night. You don’t even need that canned pasta sauce for your base to be honest Christine. You can easily make a delicious pasta sauce with canned crushed tomatoes, tomato paste, onions, carrots, celery and spices ie garlic, oregano, basil. Haha.. my parents said THE EXACT SAME THING… take it or leave it. The minute you give kids choices is the minute you open your world of picky eaters and misery in the kitchen. They will eat it as long as it’s not completely disgusting food. I love the take it or leave it approach too, we are the same way. I know my son is not a fan of peppers, but after many tantrums, refusals, etc, he lost that battle. He eats the peppers now if they are in a dish (or raw), but to be fair to him I don’t serve peppers at every meal. And I have proven to him that I do the same for me, I will eat something if I’m not a fan of it too (ie. broccoli) within the meals to show him we eat what’s there. Healthy food is important and all have their place. Irony, I love peppers but have not planted any in our garden, they just don’t grow well here. However, I planted broccoli for the first time just to see how they do. If you have a farmer’s market or farm nearby you, they often sell tomatoes by the bushel in August and September and make great sauce right from the source for freezing. We make fresh as often as possible, however we resorted to canned tomatoes or prepared pasta sauce since last year’s crop was so limited and expensive. Our tomatoes didn’t even produce enough to eat at the time much less can or freeze. So many useful tips here! I’ll have to bookmark it! We do a bit of both, but target the produce on sale rather than the junk and price match them at our local RCSS because the quality of food there is far superior in our town. There are some things we eat every week like bananas, lettuce, milk and pears regardless of cost. When those items go on sale, it’s a bonus. Otherwise, we often adjust our menu to include the sale stuff. Berries make easy portable snacks, so we load up when those are on sale. The other item I purchase on sale are crackers. They aren’t necessarily great for you, but they are also very portable and keep drive thru desires to a minimum. When we switched our eating habits to healthier choices, our grocery budget did go up since coupons are hard to find for the good stuff, but it’s worth it in the long run. It’s true Laurie. The best part is if you just brush them with a bit of olive oil and cut into triangles you can easily make your own tortilla chips in the oven. Not much in the way of shopping was required this week but the little bit that we did shop was at least on sale! What we did spend this week was a little from our “Gifts” funds. There was a going away party for one of hubby’s co-workers and I elected to bring a large raw vegetable platter as our contribution to his party. The party tray was $54.99 and I had a coupon for spend $60 get 75 Air Miles so I picked up just enough groceries to get us over the $60 mark. I do love my Air Miles! I am not including the party tray as it was “a gift” but I mention it so you know how I got so many Air Miles from such a small shop. I thought about what to take and there’s lots of salads I could have made for probably half the price but in today’s day of Vegetarians, Vegans, Gluten-Free and Paleo diets… I knew this would suit the vast majority of party participants. So, if you look at the $1,678.74 calculation that we have spent in 2014 and subtract the $250.00 we have actually saved in our “reserves” and the $159.42 we have recorded as spent but is actually set aside for future USA grocery shopping… we have actually spent $1,269.32!! That is $129.32 over the $1,140.00 we budgeted for January through June. Fortunately we have 6 weeks of vacation time still coming in 2014 when I use our “vacation funds” instead of the “grocery budget”. That’s a dollar value of $285.00 so that $129.32 will easily be absorbed and we’ll get back on track so long as I really watch the spending for the balance of the year! WOW… it’s taken my wife since what did I say 1997 to collect just over 1000 lol. I checked what we have and it’s close to 2000 but not the cash Air Miles…. I know I said I would read more into it and I best be doing that before I lose them.